Ventura Harbor Village at 1583 Spinnaker Drive, Ventura is home to 33 acres of harborside activities, shopping and restaurants. The weather is always so cool over there it makes for a nice retreat. There is a 36 horse carousel and arcade for the kids and plenty of outdoor activities available like kayaking, sailing, pedal boats, sport-fishing and cruises. 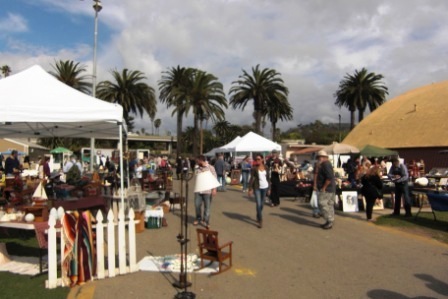 Ventura Harbor Village hosts events and activities year-round, including music performances, kids' activities, themed events, festivals and more. Eateries at Ventura Harbor Village include 805 Bar & Grilled Cheese, Alexander's, Andria's Seafood Restaurant, Surf N' Taco, Boatyard Pub, Brophy Bros. Restaurant and Clam Bar, Coastal Cone (ice cream shop), Coffee Dock & Post, Copa Cubana, Fratellis Pizza & Brew, Harbor Cove Cafe, Le Petit Cafe, Bakery & Restaurant, Margarita Villa Mexican, Rhumb Line, The Greek Mediterranean Steak & Seafood and The Parlor. You won't go hungry here. The Channel Islands National Park Visitor Center is located adjacent to Ventura Harbor Village. Free admission and an awesome resource for learning more about the Channel Islands and its protected habitat. Island Packers at the Harbor has numerous boat rides and is the only authorized concessionaire to transport folks to Channel Islands National Park. Ventura Boat Rentals rents out electric boats, paddle boats, kayaks, power boats and charters cruises in the Ventura Harbor. So much fun to be had! Across the street from Ventura Harbor Village is beach access at Harbor Cove Beach (a safe beach protected by jetties) and Surfer's Knoll Beach. Local area beaches at THIS LINK. More information at www.venturaharborvillage.com or call 805.642.8538 (or 877.89.HARBOR). The Stagecoach Inn Museum is a replica of a Monterey style inn, the 1876 Grand Union Hotel. The complex also includes a Chumash Indian village, an early California adobe, a pioneer house and a few other buildings. There is a nice park adjoining the property along with nature trails and a stream that make this a nice place to bring the entire family. Spanish Adobe structure at Stagecoach Inn is a replica of housing that would be seen in the Conejo Valley in the early 1800s. The Stagecoach Inn Museum is State Historical Landmark No. 659. The original structure was destroyed by fire in April 1970 but has been rebuilt and relocated. It was originally located at the corner of what is now Ventu Park Road and the Highway 101, where a historical marker has been placed. 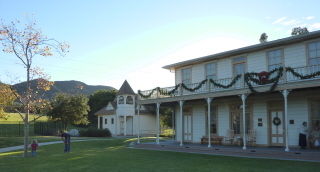 The Stagecoach Inn is located at 51 South Ventu Park Road, Newbury Park. Call 805.498.9441 or visit www.stagecoachinnmuseum.com for more information. As of March 2018, it is open from 1 pm to 4 pm Wednesday to Sunday. Adults $5, 62+ and ages 13-21 $4, kids 5-12 $2. The Olivas Adobe Historical Park is operated by the City of Ventura and serviced by the Olivas Adobe Historical Interpreters. 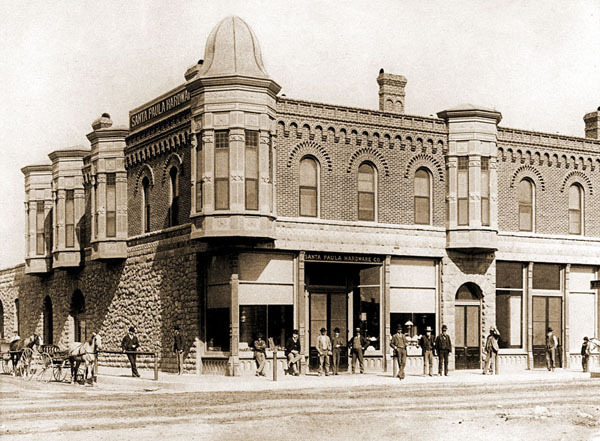 It is on the National Register of Historic Places and is State Historical Landmark No. 115. The Adobe represents a superb example of a large home from the Rancho Period prior to California statehood in 1849. The home was started in 1847 and completed in 1849 through the efforts of local Chumash people, and occupied by Don Raymundo, his wife Teodora, and their 21 children until 1899. Ultimately, the City of Ventura received the adobe and a large land parcel from the Max Fleischman Foundation that included 450 acres that extended from the Olivas Adobe to the ocean, where the Olivas Golf Course, the San Buenaventura Water Reclamation Facility and the Harbor are now located. The Park includes exhibits, extensive gardens, and the restored adobe buildings. The Olivas Adobe is also available for weddings, receptions, fiestas and special events. The Park is located at 4200 Olivas Park Drive in Ventura. Grounds are open from 8 a.m. to 4 p.m. on weekdays and 10 a.m. and 4 p.m. on weekends. Free admission. Costumed docent-led tours of the house take place on weekends from 11 a.m. to 3 p.m. (tour tickets are $5 for adults $3 for children under 12 and seniors and free to under 4). For more information, visit www.olivasadobe.org or call 805.658.4728. 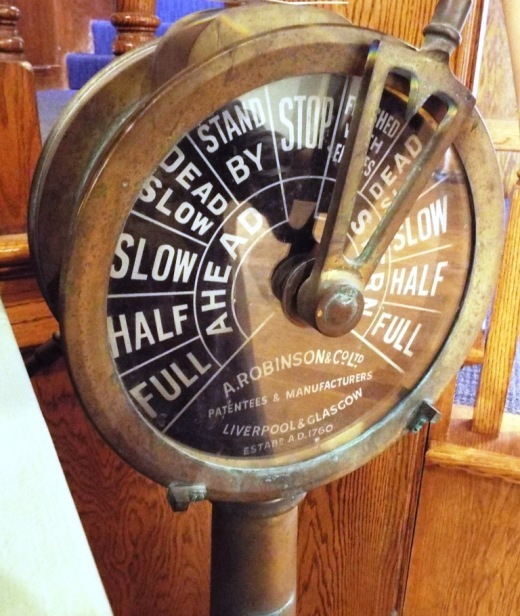 The Ultimate Escape Rooms are a recent addition to Ventura Harbor Village. There are four different themed rooms that a group of up to eight people are have to escape within a 60 minute time frame. But how? The room is full of puzzles, riddles and props that the group must decipher to come up with the ultimate "code" to escape the room. Using the combined efforts of your group, you must review the clues and solve a series of puzzles to make your way out of there. Yes, I have tried it with a group of 11 to 14 year old kids and we had a fun time trying to get out of there. Although we were unable to figure out the final piece to our puzzle, we enjoyed it. And don't worry...if the group needs clues, you can all raise your hands and you will be given a bit of help. They do not allow you to bring personal belongings like cell phones into the rooms, but lockers are provided. The current room themes as of January 2018 are: The Wizards Lair, We Are All Mad Here, The Attic and Adrift. Pricing is $39 per person but do check for special deals. We booked the entire room for a birthday party via a Groupon deal. We tried "We Are All Mad Here." Quite an interesting assortment of items on display in the room. This was an experience that none of us have ever had and the kids and I worked together to ultimately fail to get out of the room...but succeed in having fun! Gardens of the World at 2001 Thousand Oaks Boulevard is a 4 1/2 acre garden across from the Civic Arts Plaza in Thousand Oaks. It is free and open to the public Tuesday through Sunday from 9 a.m. to 5 p.m. Gardens of the World is a gift from the Hogan Family Foundation. GOTW is a stunning oasis of beauty, smack dab in the middle of Thousand Oaks. There is a large bandstand in the center of the Gardens that is a perfect venue for outdoor music. And the array of plants, flowers, waterfalls (including a stunning fountain that looks out toward the Civic Arts Plaza) and a serene koi pond next to an authentic Japanese Pagoda. There is a Japanese garden, a French garden and waterfall (shown above), a Mission Courtyard, an English perennial and rose garden and an Italian garden. A beautiful place to visit and relax for a bit, right in the heart of Thousand Oaks. Also a great place for a picnic lunch, with plenty of tables, benches and grassy areas. More info at www.gardensoftheworld.info or 805.557.1135. I never promised you a rose garden...but here's a beautiful one to check out! Since 2003, Gardens of the World has hosted a great Jazz Series on Sunday afternoons in August in this traditional American Bandstand area. 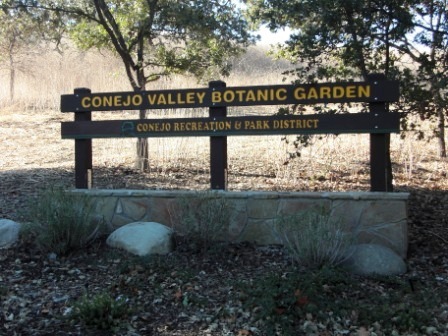 The Conejo Valley Botanic Garden is a 33 acre retreat of hiking trails and natural habitat adjacent to Conejo Community Park off of Lynn Road and Gainsborough. CVBG now offers plant sales (weather permitting) every Sunday from 11:00 a.m. to 2:30 p.m. featuring California native and drought tolerant plants. Reasonable prices! Enter at the Kids' Adventure Garden entrance (400 W. Gainsborough Road). This is really a special place to bring the kids for low key hike. There are numerous trails and a short walk/hike to the top of the mountain rewards you with sweeping views of the entire Conejo Valley, from Westlake Village to Thousand Oaks to Newbury Park. The Nature Trail is 3/4 of a mile long and meanders above the creek through oaks and willows. This is a moderate trail. The Little Loop Trail leads you above the creek, through chaparral and around a meadow. The Native Plant Section and Lower Meadow feature southern and northern California plants. Lillian's Meadow showcases perennials, shrubs and trees that thrive with minimal water. The Salvia Garden delights hummingbirds and butterflies. The Butterfly Garden is a safe haven that provides nectar and food sources for butterflies and caterpillars. The Nursery houses workspace for the plant propagation team and hosts plant sales. The Herb Garden exhibits an extensive and unusual collection of medicinal, kitchen and aromatic herbs. The Bird Habitat has a fresh water source and is planted with native plants that provide year-round food source for birds. The Australian Section features collection of plants from down under. The Desert Garden hilltop landscape features cacti, succulents and desert trees and provides a panoramic view of the Conejo Valley. The Rare Fruit Orchard holds an extensive collection of trees. The Tranquility Garden is planted in the Japanese style featuring California native plants. The Oak Tree Grove has many species of North American and other oak trees. The Trail of Trees exhibits 50 trees with a variety of genera. If you have small kids, they will love the Kids' Adventure Garden and treehouse, open on Sundays from 11 a.m. to 3 p.m. They'll enjoy hiking through the trails and exploring the streams and bridges. Conejo Valley Botanic Garden is located at 400 West Gainsborough Road, Thousand Oaks. For more information visit www.conejogarden.org. Desert Garden at the top of the hill, featuring cacti, succulents, etc. CLICK THIS LINK FOR MORE CVBG PHOTOS! The Camarillo Ranch House is a 3-story, 14 room, 6,000 square foot Victorian home built by Adolfo Camarillo in 1892. Adolfo is the son of Juan Camarillo, who purchased the land in 1866. Adolfo operated the ranch from the time of Juan's death in 1880 until 1948. Adolfo's name proliferates in Camarillo and the local high school was named after him after he gave 50 acres of land for that use. The 4.5 acre ranch was given to the City of Camarillo by the Centex Company in 1997. Today the property includes the house, a historic red barn and a stable. In 2001, the City of Camarillo completed a $1.5 million restoration of the beautiful home to exhibit what it looked like during the 1914 to 1930 time frame. The Camarillo Ranch was added to the National Register of Historic Places in 2003. The Camarillo Ranch is open to the public 7 days a week, 9am-5pm, unless there is holiday or special event. There is no charge to visit the property and walk the grounds during normal hours. The gardens have interpretive signs and there are also picnic benches available for use at lunchtime. Docent-led tours of the house are currently (as of June 2017) offered on Saturdays, Sundays and Mondays from 11 a.m. to 3 p.m. (last tour starts at 2 p.m.) but effective 7/1/17 will noon to 3 p.m. Donation of $5 per visitor is requested. The property is used for many special events and can be reserved for private events like weddings and receptions. The Camarillo Ranch House is located at 201 Camarillo Ranch Road. Visit www.camarilloranch.org or call 805.389.8182 for more information.